CD reviews: "Berlin '65 | Paris '67" and "Now You Has Jazz"
These reviews first appeared in the July 26, 1997 edition of the American Reporter. Given that Louis Armstrong and Duke Ellington were among the more prolifically recorded of all jazz artists, it's perhaps not so amazing that new material from them keeps appearing 25 years after their respective deaths. But given their leadership roles within jazz's history, it's rewarding that this is so. The new Ellington set is taken from two different concerts in the mid-'60s, and is part of Pablo's Jazz at the Philharmonic series. As with the rest of the JATP collection, the two Ellington concerts were recorded by Norman Granz, founder of both the JATP and Pablo Records (which he has now sold to Fantasy). Both shows have Duke's orchestra in top-rank form, which is no surprise since he was a perfectionist who rarely fielded any but an all-star team. On these two sets, his bands (which vary slightly) include such established Ellington stars as Cat Anderson, Cootie Williams, Ray Nance, Johnny Hodges, Paul Gonsalves and Harry Carney. The songs include such well-known members of the canon as "Things Ain't What They Used to Be" and "Rockin' in Rhythm," as well as lesser-known numbers as "Midriff" or "Second Portrait of the Lion." Ten cuts in all, and each a small gem as handled by Ellington's outfit. As with all Granz efforts, the recording quality here is studio-clear with only the applause to tell you this was recorded live. The Armstrong collection is taken from movies he appeared in or recorded for at MGM studios  "The Strip," "Cabin in the Sky," "Glory Alley," "High Society" and "When the Boys Meet the Girls." The years span from 1943 ("Cabin in the Sky") to '65 ("When the Boys Meet the Girls"). Armstrong is better known to the public as a popular entertainer, perhaps captured best by his role in "Hello Dolly." But before he became famous in movies and on TV, he helped invent early jazz and was the first superstar of jazz. The music on this CD shows both of his strengths  the beaming avuncular Hollywood personality and the consummate jazz musician whose playing was as bold a statement as was ever made in American music. Special treats here are a vocal on "Ain't Misbehavin'" and Armstrong's singular singing of the opening song from "High Society." 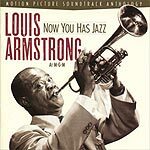 But the absolute highlights are duets Armstrong performs with Bing Crosby ("Now You Has Jazz," "Little One" and "I Love You, Samantha") and longtime collaborator and partner Jack Teagarden ("Basin Street Blues"). The musical bonds between Armstrong and trombonist/singer Teagarden are no surprise  they were as tight as brothers and ran together for years. But the evident empathy between the polished Crosby, darling of white society, and a New Orleans black like Armstrong is pure magic  proof that at its best music can rise above social constraints, and perhaps take us with it.